Our 24 hours in Orange for food and wine lovers itinerary provides a delicious taste of Orange, a rural town in the Central Tablelands of New South Wales. This fabulous food and wine destination, just over the Blue Mountains northwest of Sydney, should not be missed. If you’re heading to Australia, try to spend at least 24 hours in Orange and if you’re able try to coincide your visit with Orange FOOD Week, Australia’s longest running regional food festival, held in Orange every autumn (fall to our American readers). In 2017 it takes place from 31 March to 9 April. FOOD is actually an acronym for the Food of Orange District, with the festival showcasing the beautiful produce of the rich agricultural area around Orange. Foodie events take place in Orange itself as well as in nearby towns and villages, such as the 100-Mile Dinner and a mouthwatering meander in the countryside called Forage. Over 24 hours in Orange we were able to get a great taste of this wonderful food and wine region. We were visiting my doctor uncle who moved there to work at the hospital and those cute kangaroos you see below are grazing on his back lawn! Passionate foodie Rhonda Sear, who heads Taste Orange, was our guide over 24 hours in Orange, leading us on our delicious discovery that involved grazing the Farmer’s Market sampling local produce and regional specialties, wine tastings, and some unforgettable meals. 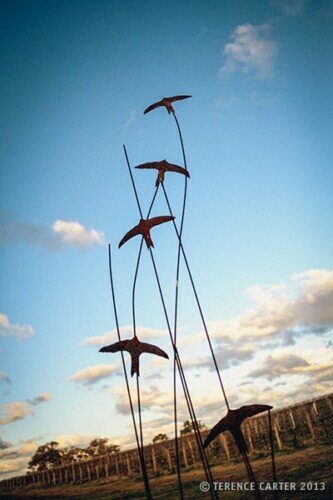 Charles Sturt University Winery, Orange, NSW, Australia. 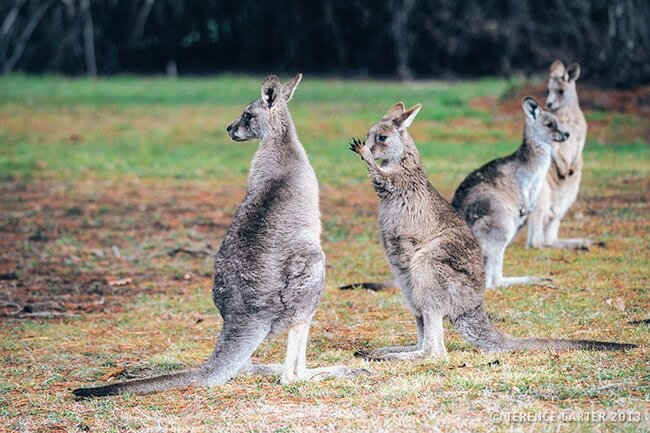 Local kangaroos, Orange, NSW, Australia. Angullong wInery cellar door at Millthorpe, near Orange, NSW, Australia. 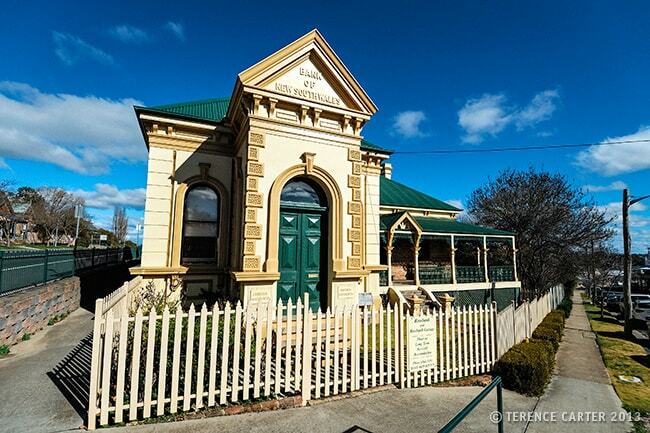 Old bank at Millthorpe, near Orange Markets, NSW, Australia. Racine restaurant, Orange, NSW, Australia. 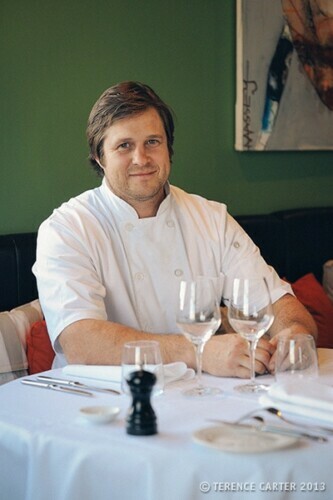 Chef/owner Shaun Arantz, Racine restaurant, Orange, NSW, Australia. 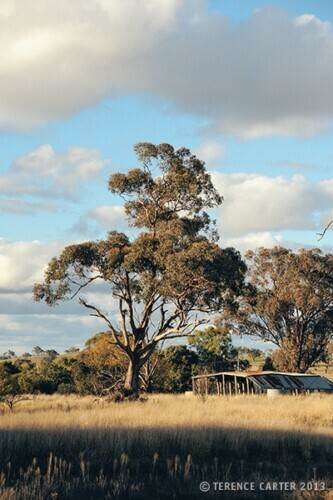 Countryside in Orange, NSW, Australia. 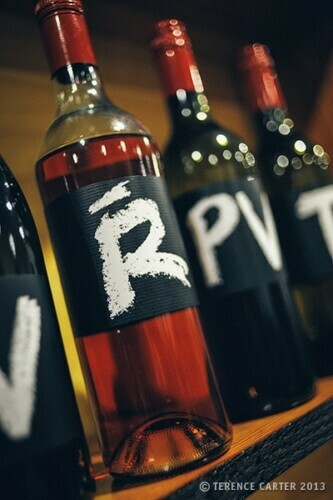 Printhie Wines, Orange, NSW, Australia. 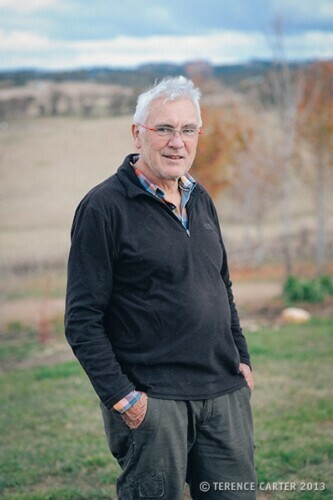 Winemaker Philip Shaw, Orange, NSW, Australia. After arriving by train and bus from Sydney in the late afternoon, we kicked off our 24 hours in Orange with some sipping and socialising with local winemakers and foodies at the launch of the Cellar Door at Charles Sturt University Winery, where they’re producing some nice premium table wines, sparkling and fortified wines. The first vineyard at their Wagga Wagga campus was planted way back in 1893. The wine and viticulture programme of what’s now considered to be Australia’s leading wine science school started in 1976. And their first commercial winery built there in 2002, so winemaking isn’t new to the University. The Orange campus opened in 2006 and their 18 hectares are planted with Chardonnay, Sauvignon Blanc, Riesling, Pinot Gris, Shiraz, Cabernet Sauvignon, and Merlot. The Wagga Wagga campus has some more experimental plantings of Aglianico, Dolcetto, Fiano, Saparavi, Tinta Cao, and Nero D’Avola. While we enjoyed the Charles Sturt Range, the Letter Series and Reserves are the real standouts, and we really loved their award-winning ‘T’ 2010 Tempranillo and 2010 Reserve Chardonnay, which James Halliday awarded 95/100. Ranging from $15-28 the wines are super-affordable by Australian standards. Unusually for a country town in Australia, Orange is home to a handful of truly superb restaurants and the first restaurant we got to try for dinner, Bistro Ceello, is one of the finest. Located in a charming old house, the elegant dining rooms were cosy on a chilly night and local chef Scott Want’s dishes were warming and comforting. 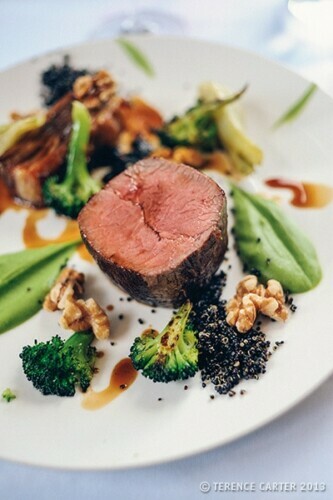 His take on French-style modern Australian cuisine makes wonderful use of regional produce with local specialties such as Mandagery Creek venison featuring on the menu. Highlights for me were the house-made pork and duck terrine with cornichons, mustard, and sourdough toast, and the seared scallops with a risotto of pumpkin and sage with curry oil, which beautifully matched with a Patina Unwooded Chardonnay. All the wines on their list are locally made too. 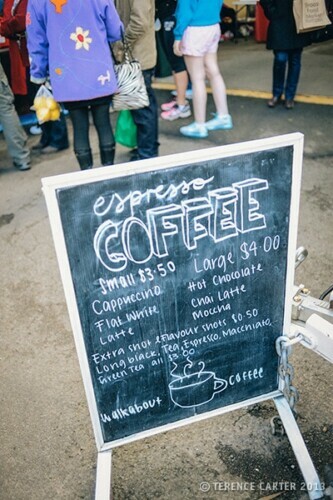 We kick-started our full day of sipping wine with a morning at the Orange Region Farmer’s Market. Coffee was followed by tastings as we wandered around the excellent Orange Region Farmer’s Market, chatting to friendly producers. Held on the second Saturday of each month, from 8.30am to 12.30pm, dozens of local producers set up stalls here to sell and talk about their delectable products. You’ll find fresh breads and pastries, coffee, free-range eggs, nuts, dairy, venison, lamb, pork, and beef, fruit and veg, including plenty of beautiful berries, as well as olives, olive oil, verjuice, capers, tapenades, preserves, jams, and honey, native flowers, plants and seedlings, ciders, spirits and liqueurs, and, naturally, wine. It’s all wonderful stuff. 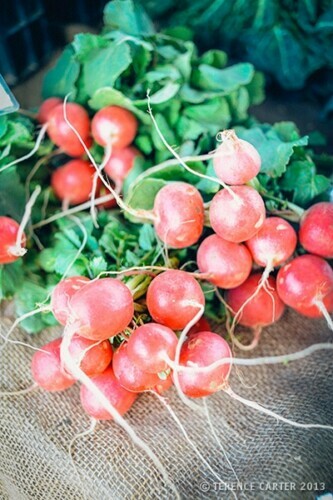 Stallholders operate on a seasonal basis so you won’t find them all here at once, so check the website for a full list of stallholders and what produce you’ll find during what season, especially if there’s something you’re particularly interested in. 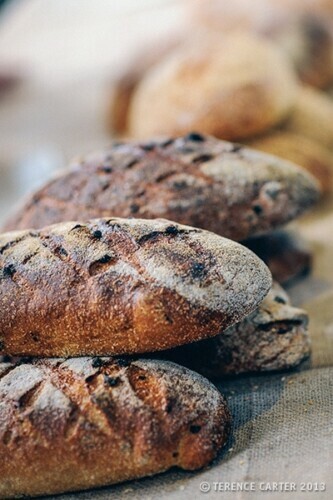 The lovely Willa Arantz of Racine Bakery sells her artisanal loaves with a smile. Willa and her chef husband Shaun also run the outstanding Racine restaurant, which we tried later that day, and they take their bread-making just as seriously. Crusty traditional French baguettes, seed and rye sourdough, ciabatta, fruit loaf, and olive oil bread were all selling fast when we stopped by to say hello. Pick up some bread, as well as olive oil, olives, cheeses, tomatoes, and cold cuts, and you have the makings of a fabulous picnic lunch you can feast on overlooking some vineyards. Bliss. Alan and Gloria Cox of Leaning Oak are Mudgee-based wine and cheese-makers and we tried their impressive, award-winning artisanal cheeses that they’re producing from their herd of 120 sheep and 50 goats. They’re making beautiful fresh cheeses, fetas, marinated fetas, blues, and soft-ripened cheeses. We took home a wonderful fresh spreadable goats cheese with garlic and chives, however, next time I want to try the sheep feta in sweet basil. 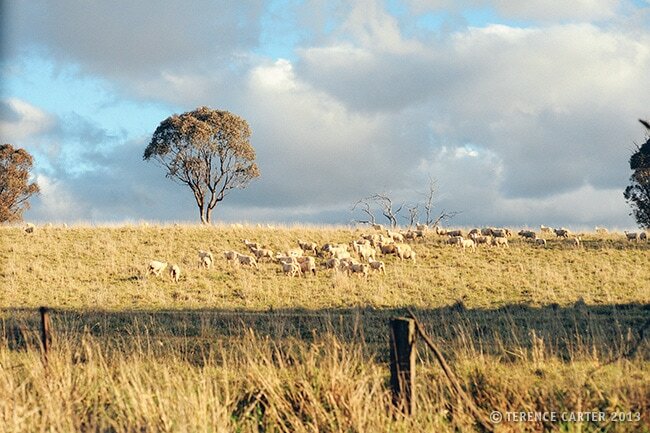 We’re also keen to get to their farm at Mudgee where they run cheese-making workshops. *Now closed. Lunch was at the light-filled Racine restaurant, overlooking the vineyards at La Colline winery, where Chef Shaun Arantz is creating his own brand of contemporary Orange cuisine. The short menu of just five entrees, four mains and five desserts or cheeses features symbols indicating which dishes are made up of 75% (or more) of ingredients sourced from within 100 miles of Orange. 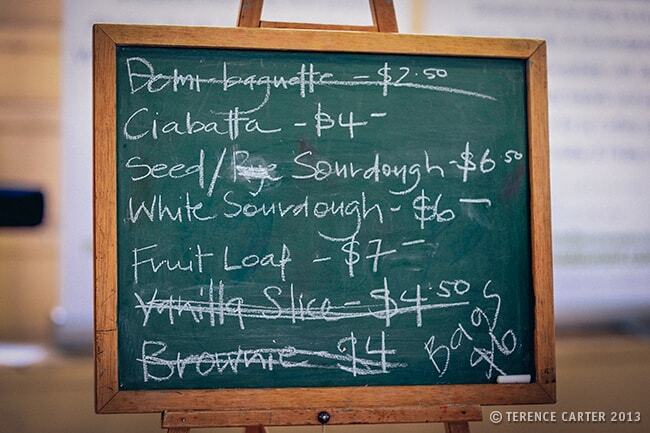 The back page lists all the fine products used: Mandagery Creek Venison, Hereford Red Beef, Cowra Lamb, Pepe’s Duck, Jannei Goats Cheese, Farm Gate Apples, Newbridge Truffles, La Barre Olive Oil, Manildra Flour, and more — with many of the vegetables and herbs coming from La Colline’s own garden. 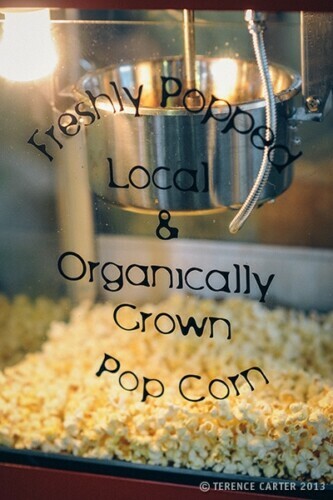 It doesn’t get more local or sustainable than that! Between the four of us we got to try most of the menu, including sublime dishes such as seared venison with beetroot, anchovy powder and baby sorrel; whole pressed duck with broccolini, chestnut mushrooms and buttermilk; a saddle of lamb with broccoli, quinoa, walnuts and fennel; and chicken breast with black truffle, leg and pearl barley ragout. It was all absolutely delicious. As with Bistro Ceello, most of the wines on the list were from Orange. 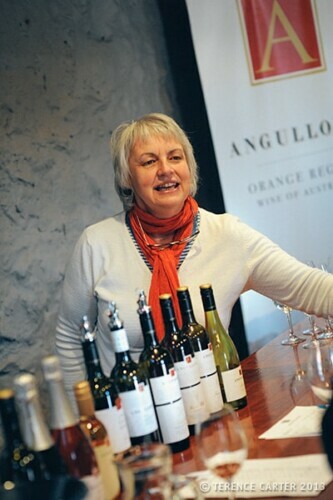 “In Orange, we make wines that people like to drink,” Rhonda told us, something I recalled each time we quaffed beautifully balanced, elegant, restrained, and accessible wines at each of the wineries we visited. Again and again we heard from winemakers we met that Orange’s terroir, its unique soils, climate, altitude, and geography are what enables the area to create such special wines. Dominated by the extinct volcano Mount Canobolas, the Orange wine region is Australia’s highest, extending from 600-1,000 metres in elevation. It’s a humid area, with mild summers (26-30ºC), cold winters (although in 2009 it snowed in November apparently, a week before summer! ), and fairly uniform rainfall throughout the year. It’s also Australia’s sunniest cool climate wine region, with over nine hours of sunshine per day during growing season from October to April. Harvest is February to April. It’s that high elevation sunshine that’s responsible for the wonderful colour, mouth-feel and flavour of Orange wine. During the warmer months, the constant sunshine ripens the grapes, yet after dark — unlike most of Australia’s other wine regions — the temperature drops considerably, allowing the vines to rest and flavours to form more gradually than they would elsewhere. For our Northern Hemisphere readers, Orange’s cooler elevated areas above 800 metres can be compared to Burgundy in France, the slightly lower elevated areas (700-800 metres) are likened to Bordeaux, while the drier and warmer areas at 600-700 metres are often compared to the Rhone Valley. 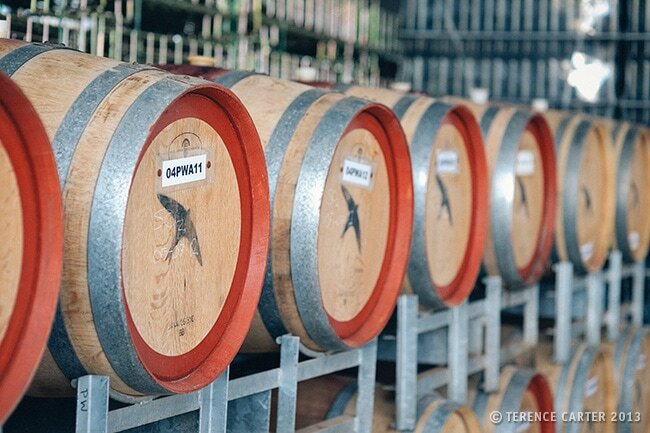 Thanks to Mount Canobolas, Orange boasts an array of rich volcanic soils that vary with elevation and topography from the extremely fertile red and brown clay loams to the red/brown sandy clay loams from old sediments like shale, limestone and slate. It’s that range of soils, along with climates, that enables Orange to grow so many different grape varietals. Grape-growing in Orange dates back to 1846 when the early settlers of British and German descent, and later Italian families, grew table grapes, however, the modern Orange wine industry didn’t kick off until the 1980s. Now, the Orange wine region has over 1,500 hectares of wine-grapes grown in some 80 vineyards for 40 wine labels in Orange, Cabonne and Blayney. We visited three winery cellar doors, all manned by the winemakers or managers — all warm, passionate, generous, and open people. The fact that the people pouring the wines at the cellar doors are also the ones making the wines also sets Orange apart from other bigger wine regions in Australia. But of course, it’s not only the terroir that makes wines special, it’s the people who make them. On what the wine tourism-marketing folks refer to as the Eastern Heritage Trail, Angullong Wines is in the historic village of Millthorpe, a twenty-minute drive from Orange. I have extremely vague memories of visiting this beautifully preserved heritage town with its imposing stone buildings and charming weatherboard cottages with my grandparents as a child. Or perhaps I dreamt it, because it’s one of those delightful towns that Australia does so well that have you imagining yourself ambling along the main street in petticoats with a parasol. In the atmospheric Bluestone Stables, Angullong Wines general manager Ben Crossing took us through a full tasting of some 14 wines, including their Sauvignon Blanc, Pinot Gris, Viognier, Verdelho, Sangiovese, Savagnin, Tempranillo, Barbera, Shiraz Viognier, and Cabernet Sauvignon — an indicator of the huge variety of grapes being grown in Orange. Standouts were the 2011 Angullong Sauvignon Blanc (lots of tropical fruit, especially pineapple, which was a good thing as that was breakfast — our first stop after the Farmer’s Market); 2011 Angullong Verdelho (bananas! — a good follow-up); 2011 Fossil Hill Pinot Gris (very elegant with loads of minerality); 2011 Fossil Hill Sangiovese (sour cherries and marjoram); and ‘The Castle’ 2010 Chardonnay (a lovely, luscious fruit-driven Chardonnay that was light on oak). By the end of that tasting, I was encouraging my uncle to move to Millthorpe and imagining myself pouring wines for Angullong — in petticoats. 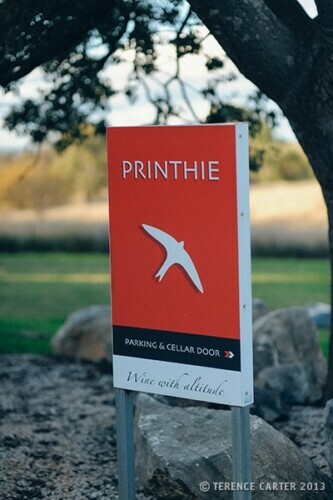 The Printhie Wines Cellar Door is on what’s called the Borenore Trail, on the way to Molong, a scenic drive north west of Orange through some quintessentially stunning New South Wales landscapes. Imagine golden pastures dotted with sheep, majestic gum trees, ramshackle corrugated iron sheds, and sprawling old homesteads. Just look at the photos above to see what I mean. A visit would be worth it for the drive alone — that Printhie Wines Cellar Door is such a delight and its wines so stunning are a bonus. Set in a galvanized iron building on the family-owned property, within a flourishing native Australian garden, the Cellar Door is striking yet welcoming. 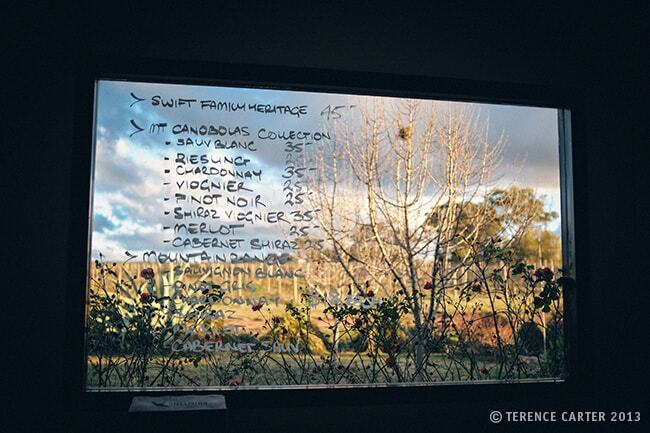 The wine list is scrawled on a picture window that looks onto vineyards that James Halliday said produce Orange’s premiere wines, made by winemaker Drew Tuckwell. 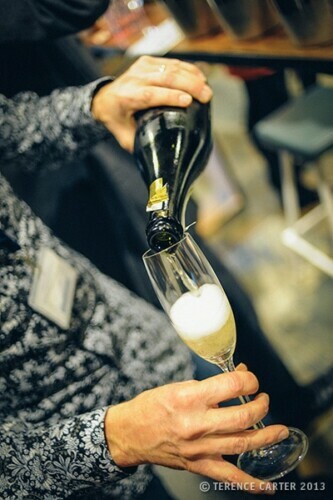 Owned by the Swift family, sons Ed or Dave can often be found pouring wines — mum and dad, Ruth and Jim, having taken a back seat in recent years. We weren’t up to tasting the full fifteen wines after our achievements at Angullong and lunch at Racine, however, we made a reasonably good attempt at five. My favourites were, from the Mt Canobolas range, the 2011 Riesling (lime and frangipani; very intense) and 2009 Chardonnay (crisp apples, citrus, and cashews; full and fresh), and from the Mountain Range, the 2011 Pinot Gris (crisp pears, under-ripe peach; yum). When we arrived at Philip Shaw Wines Cellar Door, which, incidentally and importantly, is in winemaker Phil Shaw’s home (the pouring area is actually his kitchen bench! ), the space was buzzing with the chatter of groups of friends lounging on his sofas (in his living room) and around a big table (yes, his dining room! ), all sipping wines. We felt as if we had dropped in on a friend’s party. An hour later, after Phil had closed shop, we were all seated around the dining table discussing Orange wine. An hour after that, Phil was insisting we stay for dinner — he was planning on making a curry — but unfortunately we had to wind up our Orange experience, as we had a bus and train back to Sydney early the next morning. Phil Shaw is a legend — and not just in the sense that Aussies say “he’s a legend!” to mean he’s a great guy, he really is a winemaking legend. Which explains why his Cellar Door was crowded with wine-lovers sipping and buying wine and Phil and his team busy sorting and packing and taping cases of bottles. Phil has been making wines in Australia for over forty years for some of the country’s best-known wineries and he’s now living his dream, producing some of the most beautiful wines we’ve ever tried. Favourites from our very informal tasting? The No 19 Sauvignon Blanc 2012, No 8 Pinot Noir 2009, No 17 Merlot Cabernet Franc 2009, No 89 Shiraz 2009, and two wonderful wines from his character series, The Conductor Merlot 2009 and The Idiot Shiraz 2011. When you visit Orange, you must visit Phil Shaw and you must buy these. It was a fine way to end our 24 hours in Orange. Try to time your visit to Orange around a festival. FOOD Week (Food of Orange District Week) is held each April. The Orange Apple Festival follows in May. The Frost Fest is held end of July to early August. Wine Week is in October. The Slow Summer festival is held in February. If you can’t get to Orange, Taste Orange in Sydney is usually held in August. See the Taste Orange site for dates of other festivals and events. While you can do a lot in 24 hours in Orange, a long weekend would be better. Orange is around 260km northwest of Sydney. Bus and train services depart from Sydney for Orange. We did a pleasant train-and-bus combination from Sydney via the Blue Mountains and Lithgow for A$27 per person. There are several departures a day. Check www.countrylink.info for details. You can also hire a car in Sydney for the 3.5 hour drive or fly with Rex or Brindabella airlines. We stayed with family when we visited, however, accommodation in Orange ranges from motels (handy for parking if you’re driving) and camping and caravan parks to more charming B&Bs and holiday rentals, often located in historic cottages. See the Taste Orange website for ‘bed & breakfast’ and ‘self-contained’ accommodation. In 2017, the festival takes place over 10 days, kicking off on the 31st March, and will feature a Night Market, 100 Mile Dinner, FORAGE, and a producers market, among other events. You can get to Orange on the FOOD Train. A big thank you to Rhonda Sear of Taste Orange and the passionate food and wine producers of Orange who were so hospitable and filled our 24 hours in Orange with so much deliciousness. 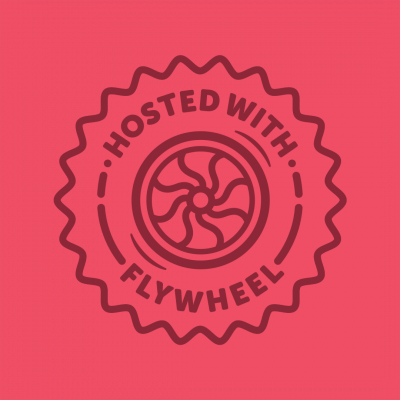 Wow…great post with lots of detailed information. Definitely must add the food festival to my list! Thanks! It’s a lovely part of Australia – especially if you’re into food and wine. Thanks for dropping by!